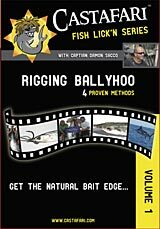 The Castafari baitrigging instructional video series is a compilation of detailed instructional videos presented by globally recognized Captain Damon Sacco. This unique series contains all of the proven and established secrets and techniques employed by the tournament winning crew of the Castafari. There will soon be 5 volumes available covering topics like rigging ballyhoo, mackeral, squid, bridled baits, kite fishing, knots and splicing, and a lot more! 4 proven methods. Learn everything you need to know on purchasing, storing, preparing, rigging, and fishing ballyhoo. These 4 proven methods will help you catch fish anywhere around the world! Proven trolling methods. Learn how to brine and hydro-gut your mackerel before use. You will also learn the secrets to rigging these baits for trolling applications which will gain you a huge edge when fishing for bluefin tuna.